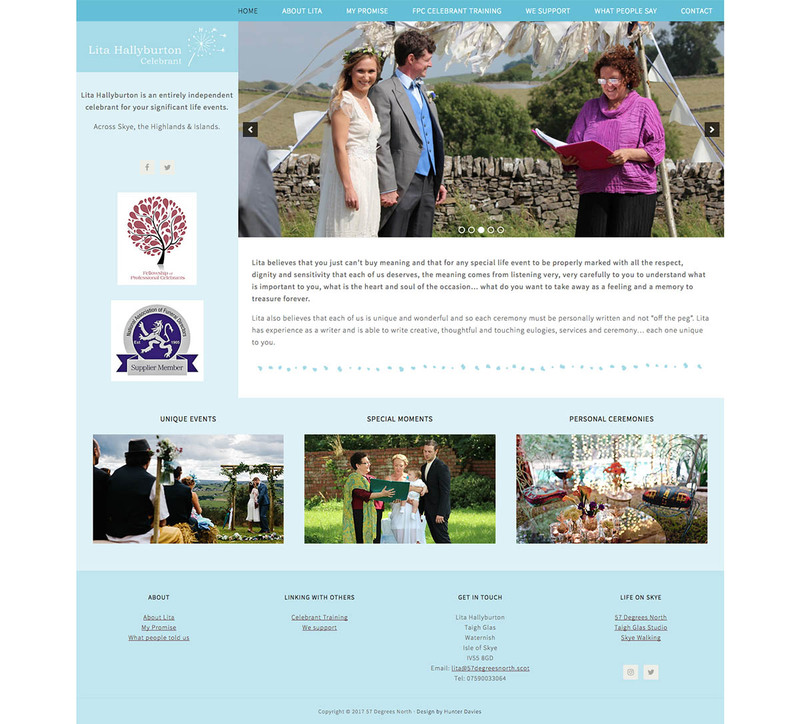 We were approached by this client to develop a new celebrant site following her recent move to Skye from the North West of England. As well as the celebrant site, we also worked on a hub site associated with our client’s relocation and new Skye-based B&B and walking businesses. The project involved logo design, website design & development. We designed a logo in tune with the client’s design inspiration and affinities, reflecting her previous logo with the delicate dandelion. As this logo was developed alongside a brand for the whole business hub, it needed to be individual as well as speak of a common brand identity. We joined the compass with the dandelion to reflect the latitude of Skye at 57 degrees North, which is also the chosen name for the joint brand. The colour palette was designed with an eye to the client’s tastes as well as the other brand logos and the nature of the business. We used the client’s extensive existing photography library and created image slideshows and photo montages to reflect the diversity of experiences and life events she is involved in.